In Union Square, Yongxin Fu, better known as The Monkey King held court over passersby. Clad in a colorful red costume and monkey mask, he spun a five-feet yellow-and-red rod rapidly and rhythmically with one hand, then suddenly hurled it into the air and caught it to the delight of the crowd. 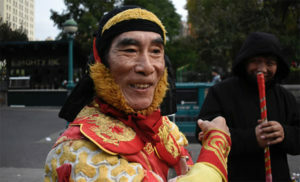 Every day for the past three years, Fu, 65, has performed as the Chinese mythological figure “Monkey King” in Union Square. The Monkey King is a legendary character in “Journey to the West” one of the Four Great Classical Novels of Chinese literature and a representative of Chinese culture. During President Trump’s recent visit to China, the Monkey King was one of the Peking Opera plays that Chinese President Xi Jinping welcomed him with. Fu is a retired doctor and an amateurish Peking Opera performer. He migrated from Zhejiang, China to New York in 2014, to be with his children who had lived here for decades. He intended to continue his Peking Opera career and brought all his costumes and instruments. But Fu could barely find opportunities to perform in New York City so he took his passion to the streets. His family was not thrilled with his dream of performing on the city streets. His vision has been a success. His colorful performance draws crowds. Passersby stop and snap photographs with him and his tip jar overflows with bills. 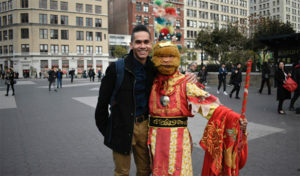 Ben Vasquez, a 29-year-old model from the Bronx, loves the Monkey King. He carried a photo of him and Fu taken two years ago on the same day at the same place. Fu gives the crowd a good show. He pays attention to every detail especially his costume which he described as a golden chain mail shirt, a phoenix feather cap, and cloud walking boots. For Fu, promoting Chinese culture and earning money are just a bonus for doing what he loves. His main goal is to stay healthy by practicing acrobatics. Although Fu speaks no English, language never gets in his way.